This post follows on from the previous two, and builds upon the ‘Highest Successful Roll’ house rule. In this post I put forward my modification to the ‘Degrees of Success’ or ‘DoS’. The DoS rules adds an extra layer of detail, but can quite tedious to apply to WS tests in combat. If you find the RAW (rules as written) covering DoS a bit slow then this mod is for you. This post follow one from the last post and makes use of the ‘Highest Successful Roll Wins‘ house rule. This post deals with taking on multiple opponents, one vs many. In the case where there more than one combatant on both sides, split them up into groups where there is one vs two or more, i.e. if you had three vs two, split them up into two groups of two vs 1, and 1 vs 1. All the house rule states ‘highest successful roll wins’ and this applies to multiple opponents too! If you are a PC taking on multiple opponents you need roll higher roll than all your opponents, yet still be under your WS. In a case of doubling up, you would have to roll the higher than both of their opponents. This is a house rule mod for Dark Heresy RPG. I’m thinking of posting up a few of my house rules I’ve collected up over the years. Most of them are forerunners of my ideas for WarSpike, which is also a percentile system, and many of these were posted on the old Black Industries forum (RIP). They have their roots in Rune Quest, Call of Cthulhu, and other percentile systems. I really like percentile systems as they are fast, but quite often later add-ons dramatically slow them down. These ad-hoc remedies keep the game flowing. My new ‘WarSpike‘ game system is coming on. I knew it was going to be a bit of a challenge considering the scope of the project. It consists of four games covering strategic, tactical, technical and political spheres, each can be played in it’s own right, or combined into the complete WarSpike ‘Spheres of War’ system. It allows you to run games at a club level using Strategic sphere and zoom into the action with Tactical where the clubs members can resolve battles, and even focus into the Technical Sphere to fight duels between champions. The four spheres allow a multitude of combinations and the Political-Technical combination allows players to run a WarSpike Role-Play Game, yet the other Spheres can be bolted onto this combination to allow a Player character to lead a unit of henchmen using Tactical to resolve their group actions, yet jump to Technical when focused in on the action surrounding the Player Character. The Player Character can even take charge of an army, and run a Strategic Sphere game ‘in game’, and send off orders that other players who can use Tactical to resolve the battles and report back as to their outcomes. To complicate matters I want it to be ‘realistic’ yet ‘streamlined’, and it’s the way combat is handled that the real innovations turn up, more of The ARMA school of thinking than the classic Hollywood nonsense. Along with the interoperable nature of all the Spheres (they all interact seamlessly. Once inside another, like Russian Nested Dolls, only these Spheres are arranged as a strange loop) it makes for an interesting system. A lot to learn, but I hope worth it to those who invest the time, and I try to make it easier as your can start with one Sphere, an while learning that you do not have to even look at the others. Yet if you do look at the other Spheres, you’ll find it all very familiar, as they share so much. Such a complex project took a bit of sorting out, and now I think the WarSpike sites work well together to show each step in the development process. I wanted to include fans in the development cycle, and so all the rules are posted on the WarSpike Development Blog to get some feedback. Once the concepts are sorted they are re-written and posted as Prototyping Pages to gain more feedback on the specific details. When the rules are working they move to the Static Site for all to see. PDF: Once all of the content slots on the static site are filled the rules will be compiled into a PDF and released for download over P2P networks for free. I will be using magnet links to ensure the correct file is downloaded and hoping fans who like the rules leave a copy in their share folder to contribute to the downloads by other fans. The PDF will be licensed under a Creative Commons licence. This is not the end on fan participation as WarSpike can be expanded with ‘Augments’ and source books. Fans can write up their own background (they can use Sciror but that’s another story) and reference the rules etc. The only proviso is they can not duplicate the rules – they have to link back to the WarSpike site so players can download the rules. The rules will always be available for free. I also plan to release a couple of Print on Demand editions, a cheap black and white spiral bound edition with no mark-up, and a premium edition rendered up as an old fight codex, full illuminated manuscript, containing all four Spheres in one massive hard copy. That I will charge for, and it will not be cheap! (If LuLu allowed me to embellish it with gold leaf I would!). This last one is about the only source of ‘income’ from the project based on product, though I think I’ll add in a donation button just in case some one feels generous. 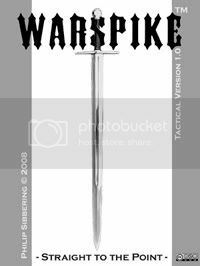 Well, that’s what I’ve been up too in my spare time, and anyone is welcome to pop over and comment of the concepts and rules of WarSpike. I’ve added a gallery for images for Galerie Daniel Maghen. The first image is my Draklodyte commissioned by Oliver. It’s based on the troll/ troglodyte I posted up in the WHF section of my site. I was asked to stick some wings on it, which I did, and the Draklodyte was born! This is a pretty powerful beastie, on thick arms it bounds along like a Gorilla, and able to scale mountainous terrain with ease. The wings are a bit small for the sheer mass which affects it’s modus operadi. I imagine that the Draklodyte climbs up onto cliff tops and ‘dive bombs’ its victims. Swooping down at great speed: straight into the back of the party! Bowling them over like skittles – Strike! It then turns on them, butts them down, sits on their chests and devours their flailing hands. It has a very tough hide and regenerative powers and is a real pig to kill, but you are unlikely to get the chance as it employs the ‘hit and run’ tactic. As soon as it’s eaten our arms it’s out of there! It will not stand and fight – ever. It’s much the same as the troglodyte this concept is based on. As such I think they are smart and cunning, they tend to be a bit shy, and only attack when they have surprise. 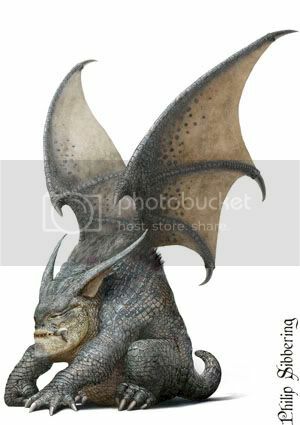 Perhaps the drakes have wings, and the troglodyte is the female? She nests in the depths of dwarf strongholds? The published image can be found in the L’univers des Dragons book published by Galerie Daniel Maghen. The ubiquitous Lasgun is the primary weapon of the IG. It is basically a streaming stun gun, delivering an incapacitating shock to insurgents to enable capture and later interrogation by the Inquisition. The Lasgun is designed with peace keeping in mind, but even peace keepers have to kill. The Lasgun has a secondary mode that is a lethal high energy ‘pulse’ setting that packs quite a punch. The electroshock is about 30W and good enough to stop the heart of most humans, and the ‘exotic’ laser can defeat lesser armours to deliver the shock. The extreme wavelength of the laser gives it unusual penetrative powers, and can create an ionisation tunnel thorough armour to deliver the shock. It can also super-heat the water in the body to cause an explosive expansion of stream. This can cause serious wounds (combined with the electroshock can hurl targets quite a distance). The last mode of the Lasgun is a low power ‘laser disrupter’ mode. This is use to mess with the vision of a charging enemy protected from the stun effect (i.e. inside a car etc.). The prime use of this is to stop vehicles are road blocks. All these modes allow the IG to be far more decisive in scenarios where civilians are involved. It has also lead to the IG view that it is better to ‘stun first and ask questions later’, the concept expanded to the ‘stun everyone and let the Emperor sort them out’ ethos of crowd control. However, the stun effect can be lethal to children and the elderly, and trigger happy Troopers have caused incidents where the vulnerable have perished to the shock effect even on the non-lethal setting. Lasguns have also be used in war crimes, torture and abuse. The most notable is the practice of ‘execute and revive’, and the use by ‘gangs’ (rogue element within the IG, or AWOL) to capture victims at long range. The Lasgun is seen as a weapon of Imperial oppression and the preeminent weapon in psychological warfare. It causes great fear among civilians; who often see the IG as having no impediment to using it. The IG are quick to stun even over minor infractions, and some seem to enjoy it and are looking for an excuse to use the weapon. Note: Some Lasgun have the pulse mode disabled due to excessive civilian deaths. Without the pulse setting the Lasgun can be ineffective against determined or protected enemy combatants. Tech note: The Lasgun may use electromagnetic radiation that can penetrate and be based on a ‘graser/ gaser’, (a gamma ray laser), x-ray laser or ultraviolet laser as an ionising medium. If so, this is why it will penetrate armour, go through mirrors etc. Running with this idea, I would speculate that in strict STC designs the graser is not powerful enough to debilitate a target immediately on it’s own, it is the electroshock that stuns and stops the target dead in their tracks. It would cause ionisation damage at higher energy levels, but this could be somewhat mitigated due to the secondary shock effect and the associated lower energy level needed to pull it off. In this concept the Lasgun is a relatively low power weapon compared to regular laser weapons that used brute force photon energy to destroy targets. It only takes around 25W of electroshock to stop the human heart. Wounds: Even peripheral strikes to limbs from a Lasgun will stun and take a person down. On the pulse setting a strike would stop the heart and render the person disabled via spasm; locked up in excruciating pain before loosing consciousness and dying. High powered Lasgun (hot shot?) may cause explosions of super heated steam to erupt from the strike zone creating large ragged holes in the flesh of the target, and induce radiation sickness. This is not a ‘humane’ weapon. How do the Tech-Priests of the Adeptus-Mechanicus eat? Ever seen one feed? Do they feed like regular humans? I was musing on this and figured something similar to my ideas of the Space Marines back-pack may prove to be a good place to start. Perhaps a little radical but how about mixing a re-breather with a backpack bio-waste recycling system to produce an integrated life-support system powered by a micro plasma engine? The system would reprocess all waste using the energy of the plasma-engine to drive the reprocessing, before feeding it back into the bio-system. As a bonus bionics can also be powered by this system. This would mean the a Tech-Priest does not each food as such and instead is powered buy a plasma-engine and ‘feeds’ on tritium (H3). This feeding could be via implant flasks with a back up (for times when fuel supply not assured) could be a face mounted hydrogen extractor to process regular air and- or water. It may be a bit extreme but it gives the Tech-Priest a nice ‘otherworldly’ feel to them. Plus is they process water they would have an excess of Oxygen and could vent it with puff of fire via a stovepipe (stovepipe is a type of top hat, and that’s not weird at all… ) or some snazzy palm mount hand flamers. This life-support system may also work wonders for Space Marines. It seems to me that that playing a PC (Player Character) in a RPG (Role Play Game) is a bit like having an avatar/ user name on a forum: some people like to get on with everyone and some do not. For a small minority the anonymity goes to their head and they mutate into trolls. I suppose they act in this way because they enjoy, and are able to do so because they are not afraid of the consequences. These same ‘troll’ like behaviour often appears during role play games sessions, these ‘PC trolls’, are players who act very destructive in the game setting. The means the GM uses to curb this behaviour is not the same as on the forum as there is a big difference. On a forum moderates have to ban, and other members ostracise and ignore. Dealing with PC it is different from the net: for while the player (the soul of the PC) is anonymous in the game world, they are not anonymous to their friend sitting around the table. That’s the difference, and that’s how you can play to their desires, but how to you curb power gaming and the players hacking and slashing all day long if that’s the aim? Change the rules of the game setting. As the reality changes so will the player’s choices and actions. If the aim of the game is career advancement and the best way to so that is kill everything guess what is going to happen? As GM I suggest the first thing to do is to change the way you handle the NPCs. You can’t control the blood-soaked player’s heart’s desires – but you can control the NPCs. Many games promote by implication or holes in the rules (and GMs follow) that NPCs do not act like living beings. Instead they act like cannon fodder and deserve little respect. In such a game I think it would be natural to kill everything in sight because why should the Players be interest in a bunch of NPC idiots? Players are people, and people like to make friends those they consider ‘one of us’ and respect enemies that can put up a decent fight. This fight usually involves brains and overcoming the odds in an RPG sense and story sense – but ‘matching levels’ is not much fun (might as well min-max, kill mooks to gain levels and then crush the boss, it’s how the game is played). I would introduce the concept of fear. An the biggest fear inducer is an enemy with intelligence, and those with intelligence are prone to fear. For example: Gretchin, the 40K goblin. No one is scared of a Gretchin. They are weak, cowardly and spiteful to those weaker than themselves and only really dangerous to the unwary. What they do have going for them is their cunning (apparently). Yet in a game they often act like heroic, fearless martyrs. Gretchin will not engage in hand to hand combat unless the PC is critically injured and the Gretchin have a ‘sure thing’. In these instances of a ‘sure thing’ the Gretchin will go for capture (for story purposes). If charged they will run away and they are fast and small, and if in a built up area with disappear down a sewer pipe of small opening quicker than you can shout ‘get ’em!’. Second they Gretchin love guns and will ambush the PCs, fire one or two shots from high ground and then leg it! Once they leg it they will circle around and attack the PC’s flanks. Rinse and repeat. These Gretchin are actually ‘cunning’. Next up is ‘set pieces’ sooner of later the PCs are going to get frustrated and chase the Gretchin, unfortunately this leads them slap bang into a pit-fall trap. In can be a dug out hole (tiger-trap) in woodland, or holes cut into the ferro-crete floor that drops the PCs into underground catacombs, basements or anything else that takes your fancy. It’s a good way of rail-roading PCs by using the NPCs and the malicious Player desires. However, sooner or later the Player will twig that you are herding them by pulling on the their nose-ring and they gain an inclination to stop acting like a bull in a china shop. Now you have ’em. Now the Players will start to think about their situation and take the threat of the ‘mooks’ seriously. Levelling up and charging in will no help because the Gretchin are being smart. It is this smart element that makes the Players think twice and pay attention to the game universe and start to look for advantage-as humans do when pressed- to find an edge. This edge may include friendly NPCs. Another point is human NPCs should have fear too, and if the PCs start torturing NPC for info, they will get bad information (the NPC will tell them anything) and other NPCs will run off (and some will come back with help). The first thing regular human NPCs usually do when you pull out a massive gun it run like hell! The only time humans do not run is if they have an advantage (if the NPCs do not run at the sight of a gun it should set of the Player’s alarm bells), and that usually means the PCs are standing in someone’s ‘territory’ and being actively targeted. This is not to say the PCs can’t have a bit of fun and kill ‘mooks’, but these should be against the foolhardy and stupid and it should be made clear the targets are inexperienced and it’s like shooting fish in a barrel (and no XP!). The death of these weak targets will not endear the PCs to the local populous, because if the targets were so weak the chances are they weren’t much of a threat and are most likely young loud mouthed gangers (who have families, and hence another hook – sooner of later the PCs learn to kill quick and quiet and without witnesses.). Oh, as for XP, give it for completing the mission and surviving not for killing. There is no benefit for killing in most cases, and let the Player know the ‘mercy’ in some cases gives kudos (and sometimes side-kicks!). The long and short of it, is that the Players are smart and creative people and they need a challenge. If you do not provide that challenge ‘in game’ by immersing them in a ‘story’ with a ‘plot’ and instead present an endless line of idiotic fearless enemies then do not be surprised if the Players act up!